Maurizio Martinucci (aka TeZ) is an Italian interdisciplinary artist and independent researcher based in Amsterdam. He focuses primarily on generative compositions with spatialised sound for live performances and installations. In his works, he adopts custom software and hardware, featuring original sonification and visualization techniques to investigate and magnify subtle vibrational phenomena. TeZ is also the founder of the Optofonica platform for Synesthetic Art-Science in Amsterdam, and a member of the legendary industrial band, Clock DVA. You define your work as a “creative investigation”. Can you explain? It’s always been difficult for me to frame my interests and actual work in one “grid” so to speak, be it music, art, science, or any other specific domain of activity. In fact, I find myself involved every other day with something that I actually don’t know much about, but that has evoked some kind of inner resonance. What excites me is the idea that I can learn something new every day and “wow” with it! The act of discovery through experiments is essential in this process, and I seem to always find a thread that connects my explorations with a pretty high degree of coherence. I like to define myself as an “independent researcher”, because it keeps the grid malleable and allows me to interact with very different people and operate in different contexts such as festivals, galleries, museums, academies, hackerspaces, makerspaces, and other experimental research centres. Investigation is the act of research that can be conducted with the flexible strategies of creativity. Creation is ultimately the materialisation of such research, and the way to give others access to that knowledge, possibly invoking their curiosity. Drawing from question 1, do you see creativity as a positivist phenomenon? As something that is not as abstract as is sometimes claimed? Nothing is abstract. Maybe we can’t find immediate and recognisable patterns in the process of experimentation, but that’s the beauty of it. The moment of discovery is the moment where the pattern emerges to reveal other dimensions, like in Pandora’s boxes. We can even create abstractions. There’s nothing wrong with it, as long as we don’t identify that with objective truth or exact description of reality. Then it becomes dogmatic and confines knowledge into a rather narrow space. In both art and science, we constantly use codes as tools of explorations. We could say that these codes are abstract, but again, they’re just instruments. You also question “art as representation” and rather prefer “art as experience”. Is art something that should be primarily experienced? I can’t speak in general for art, but for my work, yes. Addressing the so-called “lower senses” and evoking synaesthetic perceptions has been a central aspect of my work for the past ten years. In fact, it’s a strategy to avoidhabitual and culture-induced interpretations of the event one is witnessing . This doesn’t mean that looking at a traditional painting has no value. On the contrary, one has a chance to “feel” how and where that painting is producing a specific sensation inside the viewer. But maybe it makes more sense to create a space for emerging sensations rather than an object of aesthetic appreciation, if the goal is to somehow expand the perceptual abilities of the spectator. Many of your works subvert human senses – disorient and challenge the audience. What fascinates you about human senses and which ways of exploring and experimenting with them do you find the most intriguing? Working with my friend artist/writer/professor Chris Salter and with sensory anthropologist David Howse has been a fantastic opportunity to deepen these aspects and create large-scale installations that explore both the sensory and the cultural bias of perception. We’ve tried, in the course of many iterations, to explore the many intricate ways we interpret an experience through guided (at times) or completely loose paths of sensory stimulations. Subverting the visual dimension is the first and foremost strategy, for example by saturating the visual field with blasting or stroboscopic lights orchestrated in particular spatial architectures, or tricking the sight with either pitch dark environments or vision-blurring visors. The body seeks meaning by stretching the other senses to reach the boundaries of the space and navigate in it. The coupling with other haptic, olfactory, and gustatory stimuli maximizes this tension and allows novel sensations to arise that escape our own ability of description. I consider this an opportunity for expanding and accessing further levels of consciousness. In collaboration with researchers at Concordia and McGill universities in Montreal, we’ve been developing specific technologies that allow us to compose with multimodal and multi-sensory instruments. You collaborate with the legendary band, Clock DVA. Can you talk about your collaboration? I’ve been a fan of Clock DVA and TAGC since the early 80s. DVA’s turn to cybernetic music with Hacker / Buried Dreams has inspired a great deal of my music production in the 90s. My interest in spatial sound was most definitely inspired by Digitaria, TAGC’s pioneering endeavour in ambisonics, a technique that in those days was used almost exclusively in research centres. Their attempt to bring it to a larger public in those days was truly admirable! TAGC’s Meontological series is also a superb example of how music and science can mutually inform each other and trigger obscure curiosities. In 2009, I contacted Adi on Myspace and proposed a collaboration that would bring Digitaria back to its original ambisonics dimension but in the form of an immersive installation. We then met in London at the first TAGC live gig after over 15 years, and agreed to meet next in Amsterdam at my studio (Optofonica) where we could work on the ambisonics installation project. A few weeks later, I received an email where Adi invited me to actually become part of both the revived DVA and TAGC line-ups and to prepare the first large-scale live performance at Leipzig’s Wave-Gotik-Treffen (WGT) festival. We made a rather incredible show, with spatial video and sound, at WGT in 2011. Ever since then, I’ve been involved in a number of live and studio projects with Adi and I’m currently an official member of DVA together with the very talented Panagiotis Tomaras, who mostly works on the visual side. Adi and I just finished the new DVA EP, Neoteric, and we’re preparing a long overdue new album, aimed to see the light before the end of this year. Aside from the band, you have also worked with many inspiring personalities, such as Kim Cascone, Scanner, etc. Which collaboration do you most cherish? Kim and Robin, as you mentioned them, are certainly among the best “tuned” to my artistic sensibility. They’re also old time friends, especially Robin, with whom I’ve been exchanging letters, tapes, and magazines since the mid-80s, mostly stuff related to the early industrial movement. I love to play live with Robin. We never rehearse, we just meet on stage and somehow the magic happens.. and we have a lot of fun! I must also mention Saverio Evangelista (of Esplendor Geometrico) and our project M.S.B. that dates back to 1990. We’re still active and currently producing a new record too. Anyways, I cherish all of my collaborations, really! They are all different, exploring different ideas and styles. And there are many more artists I’d like to work with. 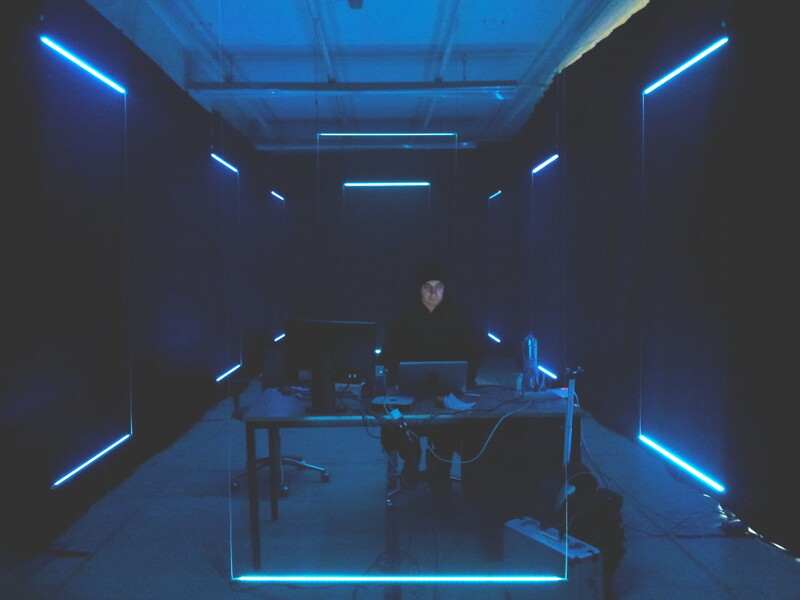 Can you talk about Optofonica Laboratory for Immersive ArtScience? I founded Optofonica in 2006 as “platform for synesthetic media and sound spatialisation”. For about 3 years, I worked really hard in order to put together a roster of artists that would showcase original live and studio works at festivals and other dedicated venues. The basic idea was to stimulate these artists to produce multichannel sound works and to collaborate with visual artists that would explore the concept of synaesthesia. This took place at a moment when audiovisual creation had become much more accessible, but often too “easy”, pop-oriented, and not very experimental (see VJ culture). In the meantime I was working on the Optofonica Capsule, an installation that is a private immersive space where the sound is produced by the actual vibration of the structure, without speakers, and therefore administrated in a much more physical way to the body of the spectator. I collected 23 pieces from collaborative works by over 40 top experimental artists for a 2.5 hour programme that would run in the Capsule and in Optofonica Screenings events with surround sound. In 2009, I decided to transform the project into a Laboratory so as to facilitate more artistic works and collaborations, and also looking at a tighter interaction with scientists. The lab has undergone a number of logistic mutations and is currently sharing space with Transnatural Gallery in Amsterdam. I’m still chasing my dream of creating a permanent space that has a constant and free public display, and where art and science projects can directly reach the general public in the form of installations, publications, and other informational material reflecting the work of the “labbers” who, like alchemists, work in the private and secret side of the lab with all kinds of instruments for acoustics, optics, electronics, robotics, fluid dynamics, electrodynamics, and also fabrication and rapid prototyping machines.